But there are occasional exceptions: Polarizing issues where you could essentially call a truce without anyone winning or losing, without it effecting the balance of power in America’s political debates and culture wars, without anything disappearing except a lot of nonsense, hysteria and panic. You could imagine a world in which the voter ID debate reflected a real and sweeping clash of interests. If conservatives were right that the laws reduced rampant voter fraud by preventing illegal immigrants from voting for Democrats in large numbers, and meanwhile liberals were also right that the laws dramatically reduced turnout among African-Americans and other liberal-leaning constituencies, effectively limiting the right to vote, then the whole debate would be extremely consequential and difficult to resolve. If that shocks you, it shouldn’t. The evidence that voter ID laws meaningfully suppress minority votes has always been shaky; a literature review in 2017 that filtered out studies with obvious design flaws reported “modest, if any, turnout effects of voter identification laws” in the best research on the subject. So a voter ID requirement might possibly effect the closest of close races, based on what we’ve learned up till now — but if the Cantoni and Pons results hold up, the real effect is basically nil. But before conservatives claim vindication, the new paper also casts doubt on the argument for voter ID laws, finding no effect on fraud itself, nor even any effect on public confidence in the integrity of the ballot. Which should be even less surprising than the absence of evidence for voter suppression, because since the George W. Bush administration a large group of people with strong incentives to uncover voter fraud — Republican lawmakers, law-enforcement personnel and conservative election researchers — have failed to produce any evidence that the problem exists on a scale that requires a legislative response. And the rare prosecuted cases generally seem disproportionate to the offense involved — with confused individuals in the dock rather than old-fashioned Chicago-style machines. There is more to the voting-rights debate than just voter ID laws; nothing in the new study settles arguments about early voting, absentee balloting and more. Still, because the ID debate is a particularly flash point, its findings are a real public service. No matter where you stand on the voter fraud-voter suppression controversies, these findings strengthen the case for dialing down outrage, reducing anxiety and generally recognizing that if we stopped pushing for these laws and stopped freaking out about how they supposedly doom democracy, voting in America would rattle along basically unchanged. But since it’s conservatives and Republicans who are the prime mover here, because they’re generally the ones pushing legal changes, they also have the primary obligation to step back and stand down. Despite what many liberals believe, much of the right’s anxiety about voter fraud is sincere, not just a cynical cover for racist vote suppression. I have had enough arguments with fellow conservatives on this issue to attest that the specter of those old Chicago operations haunts the right, along with more contemporary fears generated by a left that really does want to extend some of the benefits of citizenship to illegal immigrants. At the same time there’s also no question that a lot of Republican operatives pushing voter ID laws are cynics who expect their party to benefit from lower minority turnout, and a number of professional right-wing partisans — including our president — see an upside in frightening their voters or viewers with the racialized threat of “urban” ballot-stuffing. Which, again, is what makes the evidence from this study so helpful: It offers reasons for both the conservative sincerely worried about voter fraud and the operative cynically hoping for lower Democratic turnout to let this issue slide. And in letting it slide, Republicans might even have more to gain than Democrats. 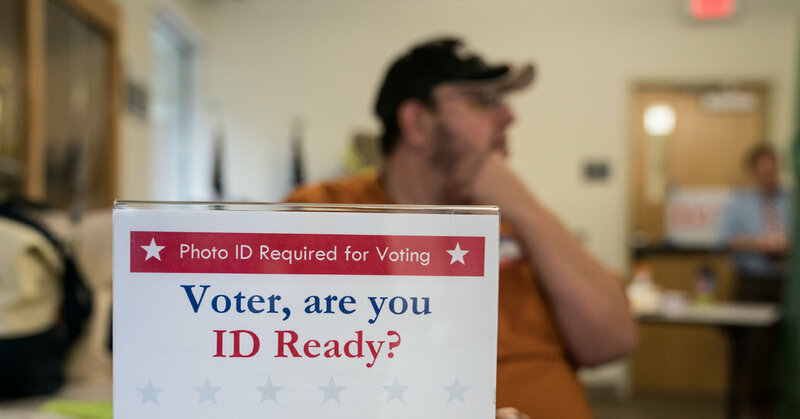 After all, the cynical side of the voter ID push is pretty transparent, meaning that even if the laws don’t have real vote-suppressing consequences, they do serve as a continuing gesture of disrespect to minority voters, a continuing expression of G.O.P. indifference to the African-American memory of what vote restrictions used to mean. So their removal from the Republican agenda could be an act of minority outreach unto itself. Maybe that’s too optimistic. But even without that upside, the case for standing down is strong. The voter ID debate essentially involves Republicans whipping themselves into a panic over a problem that doesn’t meaningfully effect their chances of winning elections, and then passing laws that whip Democrats into a panic over a problem that also doesn’t meaningfully effect their chances of winning elections. So if the debate simply disappeared tomorrow, a source of distrust would vanish without either side losing ground. There are few cases where that’s possible. Let’s seize this one.